Eric is a Chicago sculptor who specializes in the manipulation of stone. Becoming involves the mating of heavy granite with both steel and stainless steel. 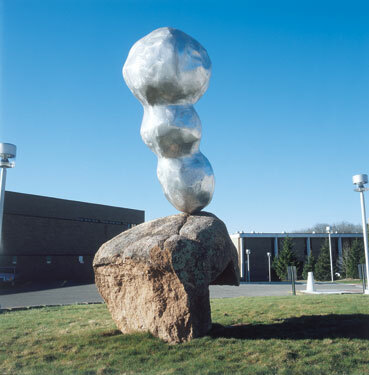 The combined action of the "lightweight", balloon shaped, stainless form, which appears to be lifting the stout stone structure from the ground, with its lower igneous counterpart provokes contemplation on the nature of growth.